Eight months after he was placed on administrative leave and four months after he was fired, controversial former Intelligence Community whistleblower ombudsman Dan Meyer is forging ahead with appeals to multiple entities to learn the precise reasons for his termination. Several senators who work with whistleblowers also want to know, and on Wednesday, Judiciary Committee Chairman Sen. Chuck Grassley, R-Iowa, predicted that the Office of the Director of National Intelligence will soon come under pressure to be more forthcoming in responding to his ongoing demands to see documents relating to the handling of Meyer’s removal for alleged misconduct. 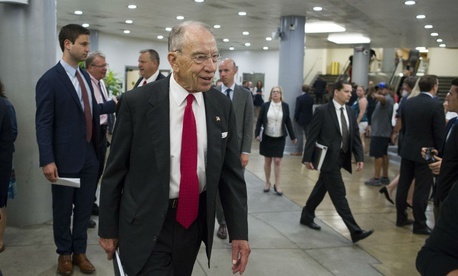 The reluctance of some agency heads to turn over certain documents to inspectors general was a key theme of the conference, where Grassley himself noted that the 1978 law he voted for specifically grants IGs such access. An ODNI spokesman told Government Executive the office would have no comment. Meyer, meanwhile, is appealing the termination decision taken by principal deputy intelligence director Sue Gordon following two separate review boards’ examination of the recommendation against him last year by acting intelligence community IG Wayne Stone and Counsel Jeannette McMillian. Both those officials have moved to new jobs, while Michael Atkinson has settled in as the Senate-confirmed intel community IG. Meyer was himself a whistleblower in his Navy days, then spent years at the Defense Department’s inspector general’s office before moving to the newly created whistleblower outreach post at the intel community IG’s office. The senators are aware that his recent appeals to the Merit Systems Protection Board were rejected on jurisdictional grounds, but he hopes to prevail by virtue of being a veteran. “The MSPB has determined it does not have general jurisdiction over ODNI employees, but the question remains open as to whether MSPB has jurisdiction over claims by ODNI employees under the Veterans Employment Opportunity Act of 1998,” Meyer said in a statement to Government Executive. “There is a formal [Office of Equal Employment Opportunity and Diversity] investigation underway. I have been waiting since Dec. 3 for my IC whistleblower complaint to be assigned for investigation by the ICIG, and other discrete investigations, reviews and evaluations are moving forward.